“The Arctic ocean is warming up, icebergs are growing scarcer and in some places the seals are finding the water too hot, according to a report … yesterday from … Bergen, Norway. …fishermen, seal hunters and explorers all point to a radical change in climate conditions and hitherto unheard of temperatures in the Arctic zone … Within a few years it is predicted that due to the ice melt the sea will rise and make most coastal cities uninhabitable”. You might think that this alarming prediction is from the latest report by the Intergovernmental Panel on Climate Change. In fact it was a prophesy made in November, 1922, and published in The Washington Post. But it was typical of the kind of doom and gloom prophesies that the end of the world is nigh which have been common throughout history – but have not, of course, been realised. I am proud to include myself in Obama’s hated Flat Earth society. I will try to explain why. Looking back on history, you will be aware that back around 1800 Malthus predicted the world would soon run out of resources unless its population stopped growing. Yet we now have about 5 billion more people than in 1800, with almost all having much higher living standards. Despite this evidence, when I attended the Royal College of Defence Studies in London in 1972, many respected scientists (and others) were still promulgating the Malthusian view and about that time we experienced the Club of Rome’s doom-laden report. The thesis I wrote back then argued that these Malthusian scientists and economists had failed to understand the way economic systems function and overcome actual or potential shortages. Indeed, the scientists involved had failed to recognise what happens in their own profession. Past experience tells us that scientific innovations occur which add to or sustain growth in living standards. Regrettably, this failure to recognise the role of innovation continues today and involves a new bunch of scientists who have concocted a dangerous warming thesis which, or so they claim, requires government action that would actually reduce economic growth. This thesis derives from the fact that our current economic system makes extensive use of fossil fuels (principally coal and oil) and that a proportion of the emissions of carbon dioxide from their usage remains in the atmosphere in a concentrated form. Heat radiated from the sun to earth is then reflected back to the atmospheric CO2 concentrations, and this heat becomes trapped in the atmosphere in a similar way to that in which heat accumulates in a greenhouse. The dangerous warming believers argue that the apparent increase in global average temperatures of about 0.7C over the past century predominantly reflects this so-called greenhouse effect. Moreover, so the argument goes, if we humans keep using fossil fuels, temperatures will continue to increase and will eventually get to levels that will threaten human existence. Some even claim, wrongly, a scientific consensus exists on this thesis and this has been swallowed worldwide by almost all political leaders, including those in our own government and opposition. For sceptics such as myself, it is (fortunately) difficult to reach any substantive international agreements on the action supposedly needed to stop or reduce global warming. But that hasn’t stopped the true believers amongst Australian scientists, economists and political leaders from saying that we should take the lead, even though our emissions on their own add very little to the global level. I recall a saying, “Don’t chop off your nose to spite your face”. But that is exactly what Prime Minister Rudd Mark 1 set out to do by appointing prominent economist Ross Garnaut, a former adviser to Prime Minister Bob Hawke, to produce a report which effectively endorsed the recommendation by the IPCC that urgent action is needed to reduce and eventually stop emissions. Of course, Rudd was in one sense simply following the lead already taken under the Howard government, but he took it further and his successor Gillard went further again. I do not intend to examine here the political labyrinths Australia has explored under the Howard, Rudd and Gillard governments. Suffice to say that our various governments, including state and local ones, have in place a range of measures designed to reduce our CO2 emissions by 5% by 2020 and to increase that reduction in the years beyond that. At present these measures include a policy aimed at producing 20% of electricity from sources other than coal, gas or oil, with an accompanying range of subsidies to producers of alternative energy sources, such as windmills and solar panels, as well as a tax of $24 a tonne on emissions of 300-400 large companies. Australia’s current policies appear to be more emissions-restrictive than those of other countries. The most controversial policy is the so-called carbon tax, which Rudd Mark 11 now proposes to abolish as from July next year. Assuming that policy is agreed by Parliament, large companies would continue to be required to buy a permit for any emissions above the level prescribed by the government. They would have to buy that permit in the market which trades in carbon permits and that permit could apply to emissions in other countries. This usage requirement to purchase effectively constitutes a tax, albeit at a rate currently much lower than the existing tax of $24 a tonne. However, the price next July and after that would not be determined by Australian policies and conditions but by the policies being pursued by the European Union and the economic conditions there. If the price stays at the $6 a tonne predicted, or even double that, it is highly unlikely that this segment of the policy would result in any significant reduction in emissions in Australia or Europe. For its part, the Opposition agrees with abolishing the tax but claims it would meet the required reduction in emissions by using taxation revenue to fund spending on so-called direct action. In such circumstances the opposition policy would also involve higher taxation than would otherwise occur. The measures to be adopted by the opposition would include an attempt to bury the carbon dioxide through a process of sequestration, to plant trees to absorb CO2 and (seemingly) to replace electricity generators which have high emission rates. However, the small amount of expenditure foreshadowed by the opposition for these tasks makes it highly unlikely that any significant reductions in emissions would occur. In short, the emissions reduction policies being pursued or proposed by either of the major parties can hardly be regarded as a serious attack on the usage of fossil fuels. Even if a 5% reduction in Australian emissions were to be achieved by 2020 that would have a miniscule effect in reducing global emissions and virtually no effect on lowering global temperatures (even assuming the two are directly connected). Indeed, as emissions by lower income countries are increasing at a much faster rate than in higher income countries, it is highly unlikely that global emissions will be significantly reduced in the foreseeable future. The lower income countries are most unlikely to make major reductions in their usage of the fossil fuels because their use is essential for raising their living standards. In short, whatever view one takes of the science of global warming, Australia is barking up the wrong tree by adopting a leading role. I will come back to some of the scientific and other issues arising from the dangerous warming thesis. To What Extent are Warmist Theories Accepted? It is difficult to assess polling on the extent of belief in global warming and on whether government action should be taken to reduce emissions. The largely one-sided treatment of the global warming issue by politicians and media means there is an in-built community tendency to favour belief and action. However, the 2013 annual poll conducted by Australia’s Lowy Institute did show a marked drop since 2009 (from nearly 70% to about 40%) in those who judge it a “serious and pressing” problem and the proportion who think the problem should be addressed “gradually” has increased from around 20% to over 40%. The fading of belief amongst Australians that global warming is a “serious” problem reflects various developments. These include the failure to obtain international agreement on substantive government action, first at Copenhagen in 2009, and then at subsequent international conferences, including Doha in December, 2012. Also important has been the Climategate exposure of exchanges of emails between scientists, the trove of documents revealing that the so-called experts who are part of the supposed scientific consensus are not only uncertain about the science but are prepared to manipulate data and use dodgy analyses to produce results that fit the theory. Although Climategate led to four “independent reviews” of the IPCC, and of the data and advice provided by some scientists to that body, they were conducted by people with a warmist view and who were not prepared to publicly acknowledge uncertainties, let alone errors. One institution subject to a review was the Climate Research Unit at East Anglia University, a major source of advice to the IPCC. In an interview in 2010 with the BBC (while his review was being conducted), the head of that unit, Dr Phillip Jones, expressed some astonishing views. These included that surface temperature data probably cannot be verified or replicated; that the Medieval Warming Period (MWP) may have matched today’s temperatures; that no statistically measured global warming has occurred for the last 15 years; and that the science is not settled. But little notice appears to have taken of these admissions by public policy makers or the media. Those sceptics who are seriously concerned about the authenticity of claims about global warming have also identified important errors in the IPCC’s last report in 2007. And they have drawn attention to the major qualifications made in the 987 page report of the key Working Group 1 of the IPCC’s 2007 report. That Working Group used the words “uncertain” or “uncertainty” more than 1,300 times and included no less than 54 “key uncertainties” that acknowledge limits to capacity to predict climate change. However, such uncertainties were not repeated in the IPCC report’s much shorter “Summary for Policy Makers”. That Summary is clearly designed to “sell” the dangerous warming thesis to governments and the public without drawing attention to uncertainties. Another moderation in opinion amongst mainstream scientists emerged from the Royal Society in 2011. In response to concerns by some members that it was wrong for the Society’s public statements to claim there is a consensus, it published a report acknowledging that "it is not possible to determine how much the Earth will warm or exactly how the climate will change in the future.” Recently the Society even agreed to hold discussions on climate change with the sceptical Global Warming Policy Foundation, headed by former UK Chancellor Lord Lawson. In the United States many sources of scepticism have emerged, led by the privately financed Science and Environment Policy Project, established by physicist and former Professor Fred Singer, and issuing an authoritative weekly critique. In the American Physical Society, which is the top body of US physicists, a large dissenting group circulated a letter in 2010 arguing that Climategate had revealed “an international fraud, the worst any of us have seen”. Then, in early 2011, after 18 warmist scientists sent a letter to Congress asking that its attention be concentrated on the view that human activity is changing the climate, 36 scientists responded with a letter referring to 678 peer-reviewed scientific studies that “offer a point-by-point rebuttal of all the claims” by the 18. Also in the US, over 30,000 scientists, including 9,000 with Phds, have signed a petition specifically rejecting the dangerous warming thesis. In Australia, a written document was sent in 2010 to the government by four respected sceptical scientists and this led to a hearing in Canberra before the then-Climate Minister Penny Wong, but the proposal for an independent inquiry into the science was rejected. Three of those scientists have cooperated with three others in publishing recently an excellent book, Taxing Air: facts and fallacies about climate change. Australia’s Productivity Commission has also expressed sceptic-type views, such as that “uncertainty continues to pervade the science and geopolitics and, notwithstanding the Stern Report, the economics” and that “independent action by Australia to substantially reduce GHG emissions, in itself, would deliver barely discernible climate benefits, but could be nationally very costly." These expressions of scepticism have so far had little overt effect on the policies of the two major political parties let alone government agencies such as the CSIRO and Bureau of Meteorology, which in 2010 produced a joint State of Climate report accepting the dangerous warming thesis and asserting that Australia will be hotter and drier in coming decades. Equally, the Fairfax press shows no sign of scepticism and, although publishing sceptical views, The Australian takes an editorial position which involves accepting that a warming problem exists but that Australia should not adopt an emissions reduction policy, regardless of what others do. Some argue that, notwithstanding the criticisms of the dangerous warming thesis, the so-called precautionary principle justifies more extensive government action to reduce emissions. But this fails to recognise the enormous uncertainties about the positions taken by scientific believers in the dangerous warming thesis and the extent of dissent to those scientists. While some say it’s no different to insuring your home, the insurance of houses against damages which are known to occur is totally different to having governments trying to insure the whole economic and social system against damage where the timing and extent is effectively unknown. The unfortunate reality is that, while sceptics are now seriously challenging those scientists who have persuaded political leaders and others that countervailing action is needed, the acceptance of that has locked “important people” into policies and positions the reneging of which would be damaging to reputations. Unfortunately, it is likely to take some considerable time before government policies designed to reduce greenhouse gas emissions are either abandoned or allowed to wither on the vine. Let me just make it clear here that, like Garnaut, I am not a scientist. But my more than 50 years experience as an economic analyst both in Treasury and outside provides a credible basis for assessing the data used to justify the dangerous warming thesis and for examining alternative explanations by sceptical scientists. Contrary to Garnaut’s assertion, qualified “outsiders” must be able to pass judgements even on science-based proposals. As pointed out by Christopher Booker and Richard North in their book Scared to Death (2008), scientists have reached many faulty conclusions with disastrous effects on government policies. As I have mentioned, an important rationale for government action to reduce emissions is to prevent damage to the economy and living standards from the ever increasing temperatures which some scientists conclude will happen if fossil fuel emissions are simply allowed to continue unchecked. Using the Final Garnaut report to provide an indicator of the possible economic effects of action to reduce emissions, we find an analysis that is highly suspect and appears designed to leave the electorate largely free of concern about likely adverse effects. The economic analysis by Garnaut (and others) is based on the idea that Australian and other major economies have adaptive capacities that allow the transfer to low or zero emissions energy sources with relatively small initial adverse economic effects. But these analysts also argue there are benefits beyond those initial adverse effects. Hence it is argued that our politicians need to apply restrictions that will, over time, reduce the use of fossil fuels and eventually replace coal and oil with other energy sources. Garnaut’s report acknowledged that, over the next half century the economic growth rate would be reduced because it would involve a move to less efficient energy sources. However, wonder of all wonders it is predicted that the economic growth rate will recover “somewhere in the last decades” of the 21st century and produce a GDP at the end of the century “higher with … mitigation than without” (p 245). Hence we suffer for about half a century but are better off by 2100 – or our grandchildren are. Indeed, almost unbelievably Garnaut’s graphical presentation shows GDP in 2100 after mitigatory action has been taken as about 5% higher than it would otherwise have been (p 267). Some important points arise from this analysis. First, Garnaut acknowledges that “the main benefits of mitigation accrue in the 22nd and 23rd centuries and beyond” (P249). The rationale for undertaking the mitigation in the current half century is that we need to prevent global warming reaching the point where human existence becomes difficult if not impossible. Hence the call for the present generation to accept a moral responsibility by sacrificing economic benefits now and “saving” our children – or is it our great-grandchildren? Secondly, the Garnaut analysis reaches a remarkably persuasive conclusion that “Australian material living standards are likely to grow strongly through the 21st century, with or without mitigation” (p565, my emphasis). In short, no serious economic problem would arise with a policy of not restricting usage of fossil fuels for the rest of the century. Indeed, Garnaut’s modelling even suggests that a do nothing policy on emissions would still mean a GDP 700% larger in real terms than today. In a separate document, released in 2008 by then Treasurer Swan and then Climate Change Minister Wong (“Australia’s Low Pollution Future: The Economics of Climate Change Mitigation”, Oct 30, 2008) Treasury arrived at virtually the same conclusion. These economic conclusions are of course very dependent on the assumptions made in the modelling and are far from being universally accepted. For example, climate economist Richard Tol, who was an IPCC lead author, has estimated that the cost of mitigatory action by 2100 would be about 40 times greater than the benefits (see “Climate folly before failure”, Alan Wood, The Australian, Oct 1, 2009). This leads to a third question, which is whether the possibility of taking no mitigatory action might lead to an unstoppable rise in temperatures. An answer to this question depends in part on our assessment of the science, which I consider next. But even if temperatures were to increase in line with the IPCC high prediction of 4.5C by 2100, today’s private sector has the capacity to respond with protective measures. In fact, with the wide range already available of technological alternatives to fossil fuels, and the considerable research assistance already provided by governments, it is quite likely that over the next 25 years one of those technologies will become economically viable. History tells us that scientific research will very likely produce either a new source of energy or an improved economic source such as nuclear power. It is surely contrary to the national interest to start now to force reductions in CO2 emissions, let alone to mandate resort to very expensive alternatives to supply 20% of electricity by 2020. If there is no economic case for urgent government action to reduce emissions, what about possible scientific reasons? Let us look first at the IPCC. The draft of the “Summary for Policy Makers” of the Physical Science section of the Fifth report of the IPCC (which was leaked) claims that the evidence forming the basis of its 2007 report has “further strengthened”. However, the projected ranges of increases in global temperature and in sea levels for 2100, which vary from region to region, appear to be lower than in the 2007 report for temperatures (now between 1.0 and 3.7 degrees) and only slightly higher for sea levels (now 29-82cm). Further, while it is claimed that CO2 is “the strongest driver of climate change compared to other changes in the atmospheric composition and changes in surface conditions”, no attempt is made to explain why there have been periods when temperatures have fallen or not increased despite increases in emissions of CO2. It is also claimed that human activities have caused more than half of the observed increase in global average surface temperatures since the 1950s. In short, it is clear that the IPCC has not changed its view that, if human activity and the use of fossil fuels continue, this will add to concentrations of CO2 in the atmosphere and hence also to temperatures. Moreover, early action to reduce emissions is the only way to “save the planet” because, so the IPCC believes, once CO2 concentrations reach a certain level it will become impossible to stop temperatures from continuing to increase. The IPCC is correct in saying that some of the emissions of CO2 and other greenhouse gases do stay in the atmosphere in a concentrated form and do reflect back to earth some of the heat radiated from the earth’s surface. However the extent to which the greenhouse effect carries through to temperatures needs to be considered against relevant data and science. Now let us consider some graphs, starting with Figure 3, which shows data of annual and ten year averages of global temperatures from 1910, published by the Hadley Centre of the UK’s Bureau of Meteorology and used by the IPCC. For Australia, similar figures published by our Bureau of Meteorology are in Figure 4. These bodies usually present temperature data in the form of ten-year averages but, as can be seen, this misses out on showing the considerable variation from year to year and also on showing important change-points which suggest changes in the trend. 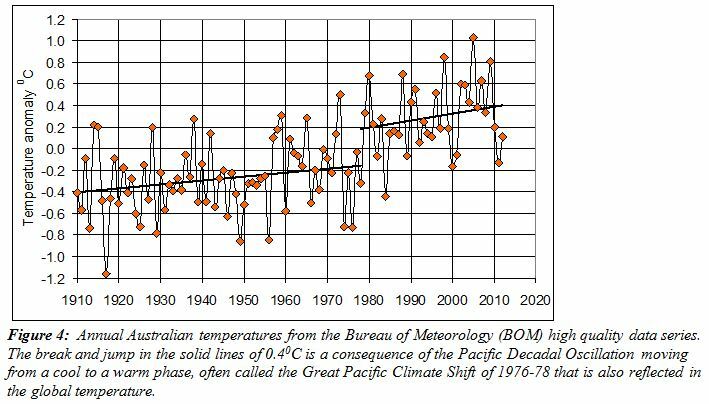 One important change-point is the increase in Australian temperatures of about 0.4 of a degree in the mid 1970s due to what is known as the Pacific Decadal Oscillation in the mid 1970s. Why is this important? Because the increase reflected natural causes arising from a sudden replacement of cold water with warm water along the western Pacific coast of the Americas and that had no causal connection with fossil fuel emissions. This suggests that, of the published temperature increase over the past 100 years or so of about 0.7-0.8 of a degree, about 50% reflected natural causes, not increased emissions of fossil fuels. 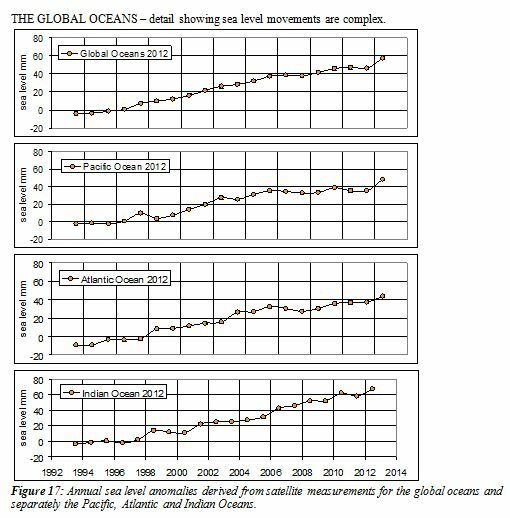 Note in particular the solid lines in Figure 3 showing the trend in global averages. There is first an upward movement from 1910 to 1940, then a decline, followed by the upward movement starting after the Pacific Decadal Oscillation, and finally the relatively flat period since 1998. This leads us to the graphs shown in Figures 8 and 9, which compare the changes in concentrations of CO2 and temperatures since 1900 . The table below summarises the changes in different periods of both temperatures and CO2 concentration levels. What the graphs and the table show is that there were two periods, one from 1939 to 1977 and one from 1997 to the present, during which temperatures were relatively stable but CO2 concentration levels increased quite strongly (except for the 1940-50 period). They also show a period when both temperatures and CO2 concentration levels increased (1977 to 1997) but where the Pacific Decadal Oscillation clearly contributed to the temperature increase. It is only in the pre-World War II period, from 1910 to 1939, that it might be said there was a causal connection between changes in concentrations and temperatures. But in that period usage of fossil fuels would have been relatively small by today’s standards. My assessment is that, on the basis of this analysis, it is difficult to justify the conclusion by the IPCC and others that there is a causal correlation between changes in temperatures and changes in CO2 concentration levels. There is also an important question about the accuracy of the temperatures published by official agencies and used by the IPCC. Climate analysis assumes that the daily temperature is the average of the minimum and maximum recorded for the day as these temperatures are the only ones available historically. However, Figure 5 shows the average temperature variations through the day for two Australian locations recorded every 30 minutes by the Bureau of Meteorology for 101 days in 2013. Physicist Dr Tom Quirk has assembled this data and calculated the average from it. 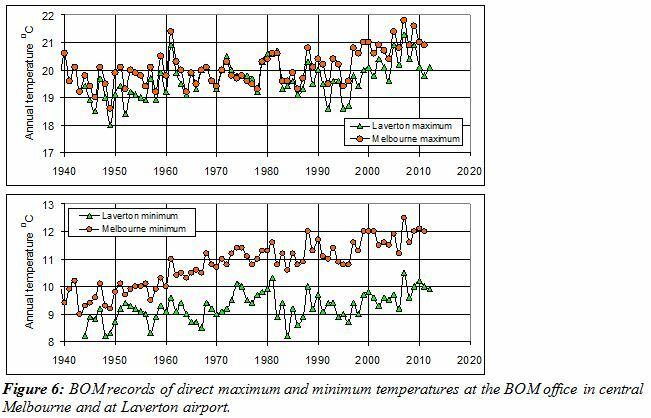 The results in Figure 5 show that in the central desert region of the Australian continent, the two approaches agree but, in the coastal and inland areas which are more humid, the averaging of minimum and maximum temperature thermometers overestimates the mean by 0.6C. In addition, as the minimum and maximum temperature thermometers respond to temperature fluctuations of 5 minutes or more and record these as extremes for the day, this results in further overestimation of 0.13C when the average of minimum of maximum temperatures is used. Based on Dr Quirk’s research, the overall upward bias in the published Australian temperatures is probably of the order of 0.3-0.4C. 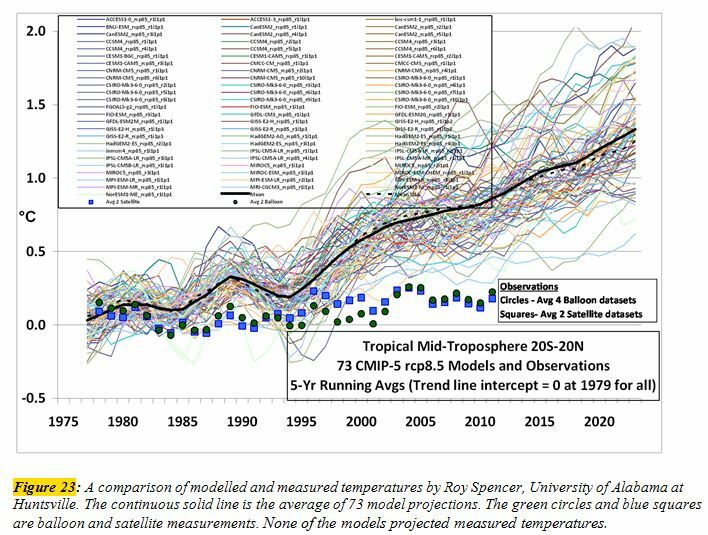 This implies that not only are Australian published temperatures deficient but so too is the modelling which uses this data. This in turn suggests misplaced concern about both the increase shown in published temperatures over the past century and the modelled predictions of future temperatures. 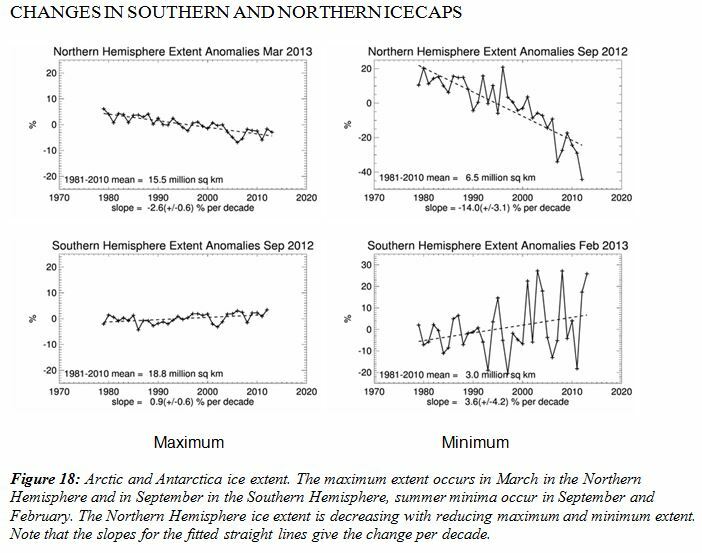 These systematic errors apply equally to other continents where maximum and minimum thermometers are used for land temperatures. Further, as ocean temperatures are measured in a quite different manner, there are systematic uncertainties when land and ocean temperatures are combined to give a global temperature. In short, even without taking account of other deficiencies in the science, the above analysis raises serious questions about the need for emission reduction policies overseas as well as in Australia. Another aspect of temperature adjustment, the urban heat island effect, may well have been ignored too, thus adding to the overestimation of temperature. This is illustrated in Figures 6 and 7. Preliminary research by Dr Quirk also suggests that, although fossil fuels emissions are currently said to comprise 55% of atmospheric concentrations, the contribution of those emissions may be as low as 16% (see Figure 20) . If this research is correct, it means that any case for extensive and urgent action to reduce fossil fuel usage is much reduced on this score alone, if it doesn’t disappear altogether. However let us assume that the published temperature data is correct. One often-made claim is that temperatures are higher now than they were a century ago and that the last decade shows the highest temperatures “on record”. This claim is often made by warmists and is a favourite amongst government ministers including the previous Climate Change Minister Combet. However, none of these warmists mention the evidence showing that higher temperatures occurred in periods before official measurements were started from about 1850. Nor do they mention that the 0.4C increase in the 1976/77 Australian temperature reflected natural causes. What about temperatures before 1850, when fossil fuel usage and CO2 concentrations were low? The IPCC’s 1990 report included a graph showing estimated temperatures for the Medieval Warming Period (about 800 -1,100 AD) higher than for the 20th century. Although the IPCC did not repeat that graph in subsequent reports, and did not explain its absence, it is now widely accepted that there is strong evidence that temperatures were higher then – and also in the Greco-Roman warm period (600 BC – 200 AD). A report commissioned by US Congress from an expert statistician concluded that there were fundamental flaws in an analysis by a warmist which purported to show, from tree rings, little or no increase in temperatures prior to the industrial revolution. The IPCC included this graph in its reports after 1990 and it became known as the hockey stick presentation, which is still the subject of international disputation amongst scientists and economists. More generally, it is not surprising that some warming from natural causes has been experienced since the end of the Little Ice Age, which occurred around 1850 before CO2 emissions became significant. Commentators on weather and climate frequently discover a record or records. But there is no policy significance in claims that our present temperatures are the highest on record. Rises over the past century need to be assessed having regard to the Pacific Decadal Oscillation, to almost certain errors in, and possible manipulations of, temperature data that gives a significant upward bias to published temperatures, and to historical evidence of higher temperatures in circumstances where fossil fuels were little used. There is certainly no sound basis for the IPCC’s use of deficient models to project an increase in temperatures to 2100 ranging from 2-4.5C degrees. I turn now to Figure 23, which compares actual average temperature with those predicted by various models used by the IPCC as a basis for its predictions. Even though the draft of the Fifth report suggests that “the development of models has resulted in more realism in the representation of many quantities and aspects of the climate system”, it seems abundantly clear that these models cannot be used as a basis for constructing emission reduction policies. The failure of any of the modelling to coincide with published temperatures reinforces other doubts about the IPCC analysis of the causes of temperature increases and, in particular, about likely future temperature increases. What about the behaviour of greenhouse gases which do not originate from CO2 emissions?, Figures 14 and 15 show a sharp increase in the contribution of methane gases to atmospheric concentrations between 1940 and 1980 and then a subsequent sharp drop. Looking at the table (below) we see that the current rate is now about the same as in the early 19th century. What then is the likely explanation of the much higher rate between the early 19th century and today? The CSIRO-BOM State of the Climate report, published in 2010, asserted that methane has shown similar increases to carbon dioxide. It made no mention of the likelihood that both the rise and fall reflect initial leakages from pipelines and the subsequent fixing of those leakages. This is just one of many examples of the failure of the CSIRO to properly identify events which influence climate – and those that don’t. In summary, there is no policy significance in claims that we have temperatures that are the highest on record. To repeat, any policy significance disappears once account is taken of five points, viz the apparent lack of a causal correlation between changes in temperatures and in atmospheric concentrations of CO2; of temperature increases due to natural causes; of calculation errors which give a significant upward bias to published temperatures; of possible manipulations of temperature data to help fit the warming theory; and of the historical evidence showing higher past temperatures when fossil fuel usage was minimal.. There is certainly no sound basis for any projection of an increase in temperatures to 2100 ranging from 2-4.5C degrees. But what about other evidence? I turn now to Figures 12 and 13. The Government’s Green paper of July 2008 acknowledged that since the 1950s the NE of Australia had become wetter (it actually appears more to be in the NW), but much attention has been given in the media and elsewhere to areas experiencing below average rainfalls and droughts. The Murray-Darling Basin has received much attention since 2000 and the Garnaut report suggested that the projected higher temperatures will be accompanied by lower rainfall. In the case of the MDB, Garnaut made the extraordinary claim that “by mid-century it would lose half of its annual irrigated agricultural output … and by the end of the century … would no longer be a home to agriculture” (2008 Final Report, p258). Even the joint CSIRO/BOM report of 2010 acknowledged that over the past 50 years “total rainfall in the Australian continent has been relatively stable” and provided no evidence that would support the Garnaut conclusion. There is in fact no sound basis for any modelled projections which might suggest persistently lower rainfalls. The variations in MDB annual rainfall clearly show no connection with levels or variations in Australia’s average temperature. 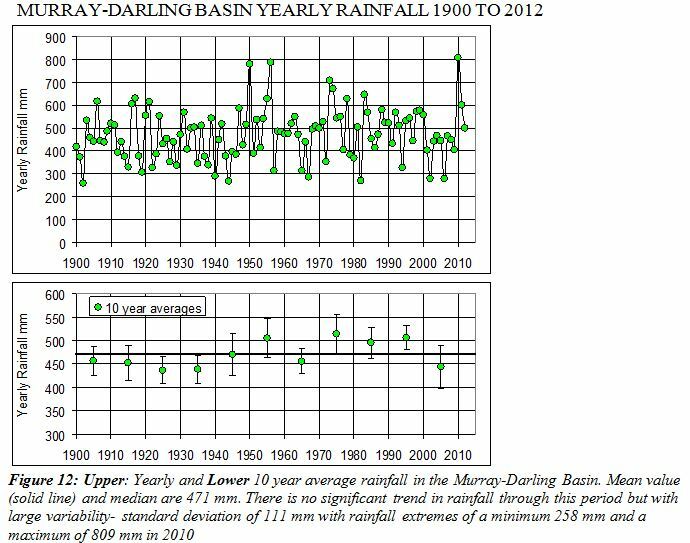 Indeed, there is no statistically significant change in MDB rainfall since 1900. Past Australian droughts occurred when global temperatures were lower than now and wetter years occurred when such temperatures were rising. There is no reason to expect that to change. Let me now consider Figures 16 to 18 on changes to ice levels in the far north and far south of the earth. It is undeniable that, if higher temperatures caused large ice sheets and glaciers to melt, temperatures, sea levels would rise and low-lying land would become more susceptible to flooding. The threat of persistent floods is constantly in the media and in discussions of preventive policies. The 2007 IPCC report predicted an increase in average global sea levels to 2100 ranging between 18 and 59 cms (about 2 feet) and the draft Fifth one suggests a slightly higher increase range (29 to 82cms). 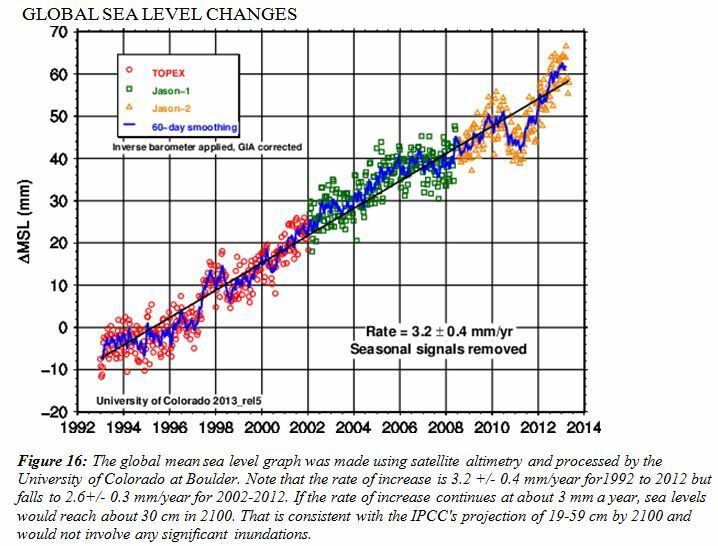 In fact, the satellite measurements of sea levels from 1994 in Figure 16 show an average rate of increase close to the lower end of the 2007 IPCC’s lowest predicted range for 2100. Also relevant is the statement in 2009 by the “real” experts in sea levels, the Dutch Meteorological Institute, that there is “no evidence for accelerated sea-level rise”. Yet both Prime Ministers Rudd (Mark 1) and Gillard conducted what can only be described as scare campaigns that climate change threatens sea levels that will likely inundate many thousands of houses near the sea. One briefing instructions to Labor MPs in 2011claimed that “sea levels could rise by up to a metre and possibly even more by the end of the century … up to 250,000 existing homes are at risk of inundation”. Owners of properties close to the ocean are being stopped from development by measures that have been introduced by councils because of such alarmism. It is possible that such owners may be able legally to challenge such measures. As to the Arctic (Figure 18, Top Half), while meltings did sharply reduce the extent of sea ice in 2007, this occurred when global temperatures were falling and during a period of cloudlessness in the area. Although a downward trend remains, more extensive Arctic meltings have occurred in the past when CO2 emissions were very much lower. It is also important to understand that meltings in the Arctic have no effect on sea levels because the ice there is already in the sea. Canada’s North West passage has in fact been navigated in periods when fossil fuel usage was low. As to the Antarctic, the total ice area there has been increasing and recently reached record levels. Break offs of sections of the Antarctic ice sheet attract media attention but such break-offs are normal. 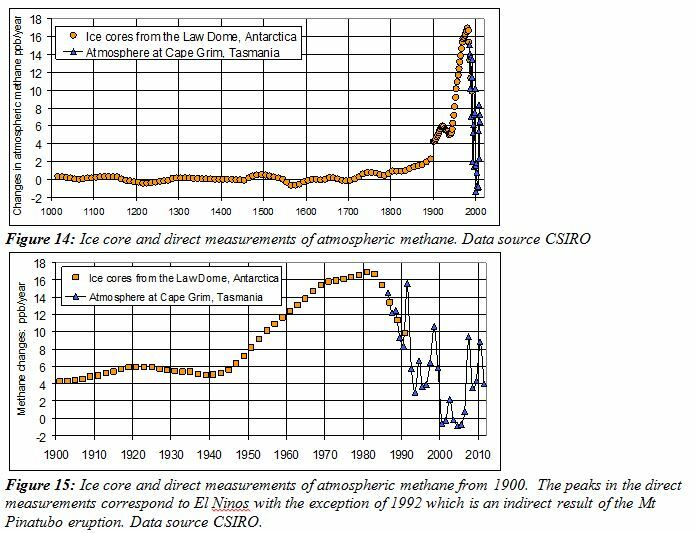 Satellite data covering the past thirty years show a distinct cooling of the Antarctic region. Turning to the Great Barrier Reef, it is watched over by a Foundation that expresses concern from time to time about possible bleaching caused by global warming. However, any action by Australia to reduce emissions would not help there unless there is an effective international agreement by major emitters. It should also be noted that most of the reef recovered from the bleachings of 1998 and 2002, which probably resulted from the temporary warming of sea water during the light winds which occur at the time of El Ninos and that limit the flow of cooler water across the reef. In any event, the current debate is focussed on the quality of the water flow from the mainland rather than bleaching due to higher temperatures. The Reef may have a stronger capacity to continue than is thought by some. I turn now to figures 21 and 22. The IPCC’s 2001 report acknowledged that the climate is a “complex, non-linear, chaotic object” and that long-term prediction of climate states is “impossible”. However, all such analytical qualifications have since disappeared and the politicisation of climate science has almost certainly played an important part in that. Figure 21 is difficult for a non-scientist to explain. Most importantly, it shows that increases in C02 concentrations in the atmosphere do not result in a commensurate increase in radiation back to the surface of the earth. Let us consider what would happen if CO2 concentrations were to double, which is what the IPCC 2007 report projected to happen by 2100 if there is no government action to reduce emissions. Figure 21 shows that, if concentrations doubled from existing levels of about 400ppm to 800ppm, this would only increase radiation back to the earth’s surface by about 10%. (The left axis of the graph shows an increase in the level of radiation of only about 3 watts per square metre – from 29 to about 32 watts). 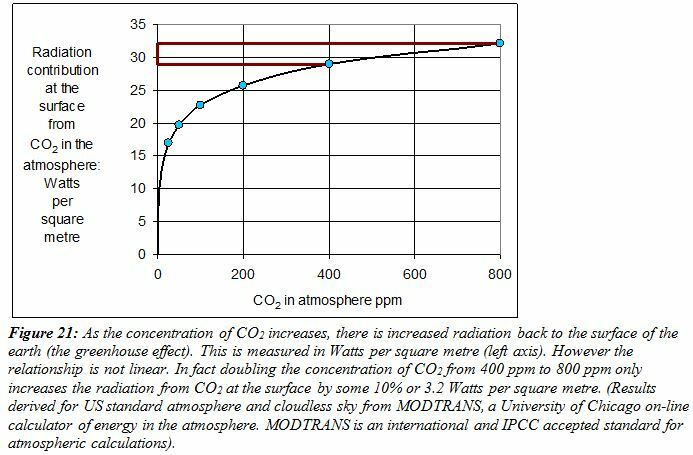 This analysis comes from an online calculator of energy in the atmosphere (MODTRANS) and is an internationally accepted standard for atmospheric calculation. The question then arises as to what would happen to surface temperatures, and what would be the implications for the modelling of temperatures. As already indicated, temperature and other components previously used by the IPCC to construct models which project temperatures to 2100 appear to have had fundamental flaws. The draft of the fifth IPCC report says that its modelling produces net positive feedbacks from increased CO2 concentrations, that is, it is still assumed by the IPCC that the radiation effects back to earth and oceans cause some initial rise in temperatures. But other respected analysts argue that this assumption does not take adequate account of the temperature reducing effects from the negative feedback coming from the strong increase in evaporation from the ocean (which constitutes 70% of the earth’s surface). Evaporation also occurs as surface temperatures rise. In short, experts who are not warmists claim that the positive feedbacks could in fact be cancelled out by the negative ones and no temperature rise might occur. This is another example of why the IPCC models overstate the net temperature increasing effects. It is not surprising, then, that the modelled outcomes of larger CO2 concentrations by the IPCC have consistently produced a much larger increase in surface temperature than occurs in practice. The possibility, already mentioned, that there is a considerable overstatement of the extent of concentrations of CO2, adds weight to the reservations about modelling outcomes. 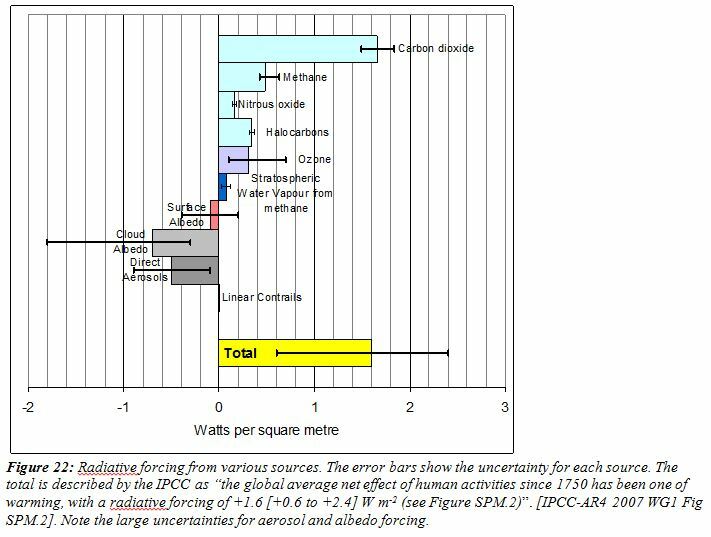 In any assessment of the IPCC analyses account also needs to be taken of possible errors in the assumptions made about the effect on temperatures of the various warming or cooling influences. These influences, which are described as radiative forcings back from CO2 concentrations in the atmosphere, are shown in Figure 22. This figure shows about ten influences, of which three are cooling. Importantly, each influence has an error range. For example, although the estimated cooling influence of clouds varies from about 0.3 to 1.8 watts per square metre, the IPCC assumption is that it will be only about 0.7 watts. Some of the assumptions are based on opinions of experts, not measured data. If the assumed warming influences are overstated, which is quite possible given the margin of errors, this would on its own obviously reduce the credibility IPCC’s temperature projections. What all this means is that, even leaving aside other possible defects, the wide margins of error in the estimates of the temperature effects arising from the various influences highlights the very considerable uncertainties about the assessments by not only the IPCC but the policies adopted by various governments around the world. I summarise my assessment as follows. There are fundamental faults in the statistical and scientific analyses used to justify the need for early comprehensive mitigatory action by governments; claims of a consensus on the IPCC science have no credibility and account is not taken of the long history of faulty analyses by scientists; examination of the temperature and CO2 concentrations data indicate that any green house effect on temperatures to 2100 is likely to be very much less than the IPCC (and other believers) predict; there is no satisfactory explanation of why temperatures did not increase during two lengthy periods when fossil fuel emissions did so; new research adds to existing evidence that temperature increases in the last 100 years or so have been considerably overstated; new research also suggests that the extent of carbon dioxide in atmospheric concentration is much smaller than previously thought; there is no substantive evidence of threats from rising sea levels or meltings of sea ice in the Arctic or Antarctic; there is no evidence of any significant change in average rainfall or that droughts and other severe weather events are likely to occur more frequently. In a word, my assessment is that the best policy for governments, businesses and individuals is to adapt to changes in climate.